Abuja — Barely a month and a half to the start of his second term, President Muhammadu Buhari is weighing his options for a new cabinet that would help him to deliver on his campaign promises to Nigerians. But the president kept faith with the ministers, perhaps in the belief that they would improve and help him shore up the confidence of Nigerians in his administration's capacity to meet their basic expectations. THISDAY sources close to the president said the outcome of the presidential election, which though he won by close to four million votes ahead of his main rival, Alhaji Atiku Abubakar of the Peoples Democratic Party (PDP), was said to be an eye opener for the president, who is said to have come to terms with the reality of majority of Nigerians' disillusionment with the performance of his administration. "The president is not carried away by the euphoria of his victory at the poll. Rather, he is acutely aware that Nigerians seem not too impressed and he is determined to make amends," a highly placed source said. According to him, "The president intends to do a clean sweep of the cabinet by gathering a new bunch that would help him deliver the dividends of democracy to Nigerians." 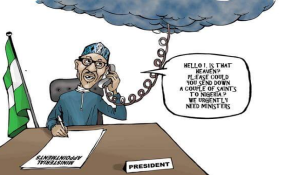 "Ministers would appear to have left their tasks and are now running around close associates of the president to help them keep their job," a source said, adding that Buhari is already compiling a list of such ministers, vowing to ensure that they do not make the next cabinet. "That is not likely to happen," said a close presidential aide, who is part of the search team for what he called "brilliant but experienced technocrats for the task of making the next term more meaningful and eventful for Nigerians." "He plans to send his list of ministers to the Senate almost immediately it is convened in June," a close associate told THISDAY last night.